I have always been the type of person that likes to keep my teeth looking nice, clean, and as stain free as possible. I watch what I eat, I don't smoke, I rarely drink dark colored drinks, I brush, and I floss. I don't have insurance so I can't afford to go to the dentist as often as I probably should. 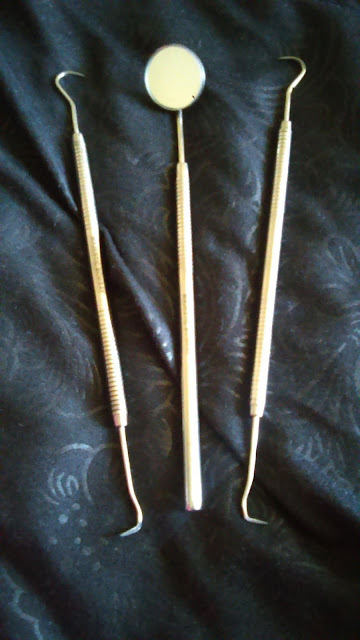 My husband has his own set of these tools from another company and his are very thin and look like they won't last very long. They also cost way more than these do. These are better quality. I can't see these breaking for years and years. They work nicely for removing food from between teeth and also for scraping off a bit of tartar buildup. They are very tough, so it's best to try and clean your teeth gently, so not to destroy your teeth. I know the company's picture shows three different kinds of tools, but I actually received two of the exact same scrapers and a mirror. Instead of complaining, I just gave my husband one and kept one for myself. Worked out for us just fine that way. Here is one thing to remember with these tools. It's best to keep them in a dry place. My husband left his in a toothbrush cup and water had collected inside causing the bottom of the mirror's end to start to rust. Glad that I noticed that before it got worse. This kit is available for purchase on Amazon.